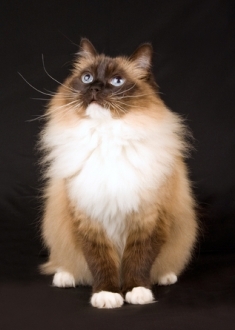 Ragdoll cats are large, semi-longhaired domestic cats with vivid blue eyes. They are known for their gentle and laid-back personalities which has also led to many myths and some controversy. 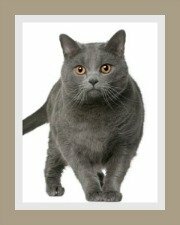 Whilst they may have originated from free-breeding feral cats, it was due to the efforts of early cat breeders like the controversial, Ann Baker and the dedicated Dayton family that the breed has achieved the status of one of the most popular cat breeds in the world. Ragdoll cats are substantial cats - they have a large, medium-to-long body with well developed and firm muscles and are heavily boned. Males are larger than the females and males are slow to mature, reaching maturity at around 3 - 4 years. They should not be fat! Some cats do have a fatty 'stomach pad' on the lower abdomen which is known as the greater omentum. 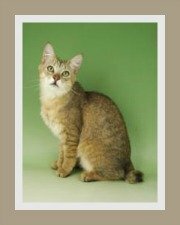 These cats have medium-long, heavily boned legs and the hind legs are covered in long fur. Their tails are long, fairly thick and well furnished and fluffy - this is sometimes called a plume. The head is medium to large in size, slightly wedge shaped with rounded contours. The Ragdoll is characterized by well developed cheeks, slightly rounded muzzle and well developed chin. Jowls may be present in adult males. Ears are medium in size with rounded tips and they tilt slightly forward. To complete the picture, they have large, oval-shaped eyes and the eye color should be an intense, vivid blue. These cats have magnificent coats. Their coats are semi-long, silky-soft and plush and they have minimal undercoat, which means that the coat is less likely to matt. The coat lies close to the body and when the cat is in motion the hair tends to separate. The hair on their face is short, whilst the hair on the ruff is longer, shorter on the shoulders and then lengthens toward the tail. It is important to note that there are seasonal changes to the coat and the coat color does darken with age. It may interest you to know that most Ragdoll kittens are born without color (except the Sepia and Mink variety) and color starts developing within approximately 12 hours after birth. Patterns for pointed Ragdolls include Bicolor, Mitted and Colorpoint. 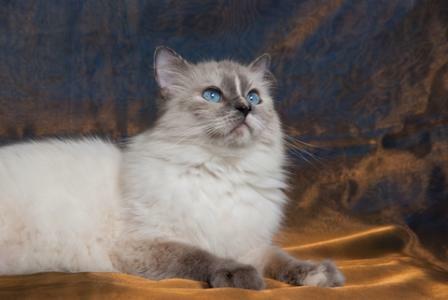 Colors for Pointed Ragdolls are Blue Point (slate blue); Lilac Point (frosty gray); Cream Point (apricot to buff cream); Seal Point (deep seal brown); Flame Point (deep red or deep orange) and finally Chocolate Point. Point colors may be lynx, tortie or solid. Colors must be clear and show clear contrast between the points and the body. In the Mitted, Vans and bi-color Ragdoll, the points may be partly overlaid with white. It is preferable to keep cats indoors as a safety precaution. Cats that are allowed to free-roam are at risk of been injured by motor vehicles, dogs and other cats. Outdoor cats are at greater risk of contracting infectious feline diseases. 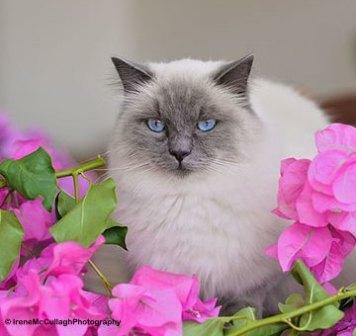 The Ragdoll cat breed thrives indoors, but they do need sufficient space to exercise and explore and you do need to provide them with a cat-friendly environment filled with toys, cat gyms, cat scratchers and possible even an indoor garden. You could of course create an outdoor adventure zone for your Ragdoll cat. By outdoors we mean an enclosure which is closed on all four sides (the roof included). This enclosure would lead off one of the rooms in your home into a quiet, safe, escape-proof area of the garden. They make ideal pets for people living in spacious apartments. 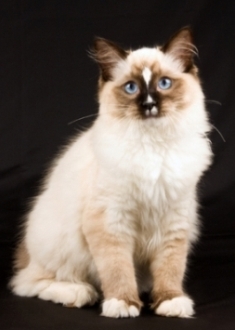 Ragdoll cats are possibly best suited to a mature family or a family with older children. They do tolerate dogs, provided the dogs are gentle, docile and calm. 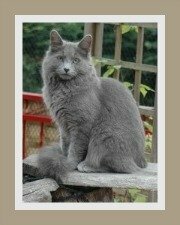 These cats have a superb disposition and are wonderful companion cats. Ragdolls are laid-back, docile and relaxed cats. They are gentle and quiet and adore human companionship. They are not lap cats in the true sense of the word - most 'Rags', as they are affectionately called, prefer to sit next to you or close to you rather than on top of you. 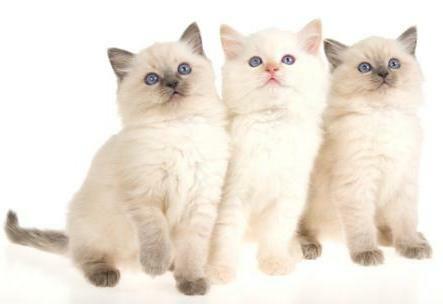 Ragdoll kitties are described as a playful, but not overactive. They love to have their tummies scratched by people that they trust. They are sociable, but generally do not tolerate too much noise and dislike being agitated and roughly handled. They are intelligent cats that can be trained to walk on a leash, come when called and even trained to do tricks. Do pay special attention to the 'arm pits', the neck area and under the tail - you want to avoid matting. 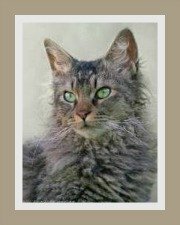 Visit the chapter on cat hair care for great tips and advice for grooming longhaired cats. 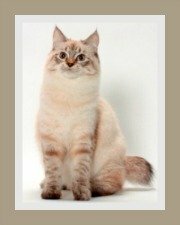 The Ragdoll cat is a robust and healthy cat breed. Some breeding lines are prone to a heart condition known as Hypertrophic Cardiomyopathy (HCM) which can be screened for. We suggest you purchase your kitten from a breeder who can provide proof that the kitten is HCM negative. We have heard that they have a sensitive gastrointestinal system which can cause occasional vomiting. We cannot confirm if this is a general problem. Like all cats they are susceptible to common infectious feline diseases so please do vaccinate your cat. 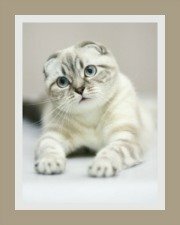 Veterinary fees can be expensive, so you should always consider medical cat insurance for your pet. To keep your cat in good condition and healthy, you should feed them the best cat food possible. Ragdolls are prone to obesity, so do not over-feed them. The chapter on cat food provides excellent information on the different types of feline foods and cat nutrition. A cat that receives a healthy diet, adequate water and exercise and annual inoculations, de-worming and dental care could live to 20 years. The average life span is about 15 years.